One-dish-suits-all! 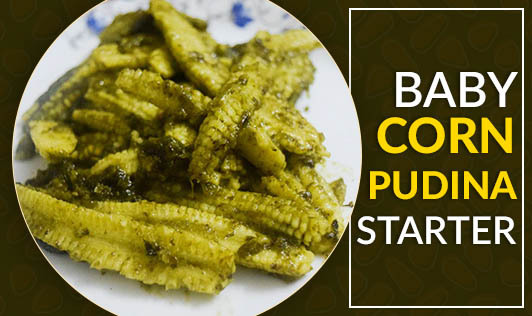 Sautéing mint and coriander instead of deep-frying has zapped off the excess calories and pepped up the nutrient-content, adding an interesting colour and flavour to the crunchy baby corn. 1. Combine all the ingredients and blend in a mixer to a smooth paste, using very little water. 1. Boil baby corn in salted water till they become soft and are cooked. 2. Combine baby corn with the prepared chutney in a bowl, toss well and keep aside for 10 minutes. 3. Heat butter in a broad non-stick pan, add the marinated baby corn and sauté on medium flame for a minute. 4. Add cornflour, black salt and salt and sauté on medium flame for another 2 to 3 minutes. 5. Serve hot with onions and lemon wedges.